The diplomatic agreement reached by nations on November 15 to begin addressing concerns about fully autonomous weapons or “killer robots” was the most significant milestone to date for the Campaign to Stop Killer Robots, which is working to ensure that targeting and attack decisions are never relinquished to machines. It capped off what has been a remarkable year for this international coalition of non-governmental organizations, which can claim much of the credit for drawing attention to the relentless move toward full autonomy in lethal robotic weapons systems which, unchallenged, would forever change the way wars are fought. Until one year ago, no government had expressed any concern about fully autonomous weapons. The agreement by 117 nations to the Convention on Conventional Weapons to begin formal discussions on this topic reflects the rapidly growing international awareness of and concern over the need for human control over the decision to select targets and engage force. Until one year ago the prospect of fully autonomous weapons was being hotly debated by a relatively small community of specialists, including military personnel, scientists, roboticists, ethicists, philosophers, and lawyers. Several of these experts established a non-governmental organization in 2009 entitled the International Committee for Robot Arms Control (ICRAC) to call for international action. But that was soon to change. In October 2012, representatives of seven NGOs–ICRAC, Article 36, Human Rights Watch, IKV Pax Christi, Mines Action Canada, Nobel Women’s Initiative, and the Pugwash Conferences on Science and World Affairs–came together in New York to discuss the possibility of a coordinated effort to tackle the issue of autonomous lethal robots. We agreed to join together as a steering committee to establish the ‘Campaign to Stop Killer Robots.’ Not long after Association for Aid and Relief Japan and the Women’s International League for Peace and Freedom joined the steering committee. In November 2012, Human Rights Watch published Losing Humanity: The Case Against Killer Robots, which called for a ban on fully autonomous weapons. This was the first detailed report by a non-governmental organization to consider the multiple concerns with the weapons. Two days after Losing Humanity was released, the US Department of Defense issued a policy directive that, according to some views, requires a human being to be “in-the-loop” when decisions are made about using lethal force. This was the department’s first public policy on autonomy in weapons systems and the first policy by any country on fully autonomous weapons. 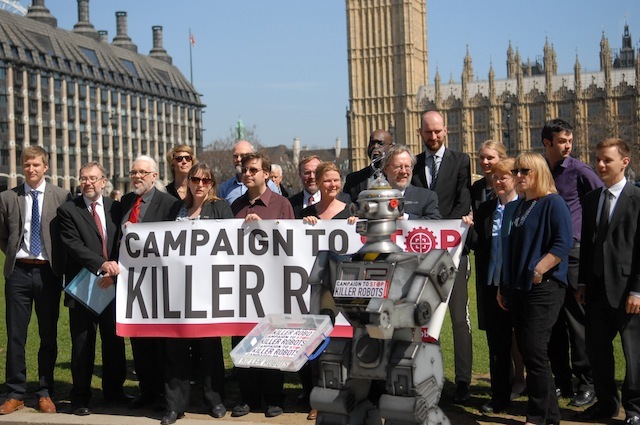 Then, in April 2013, as planned, the steering committee held the global launch of the Campaign to Stop Killer Robots in London, issuing its call for a preemptive ban on the development, production, and use of fully autonomous weapons. The campaign, which is coordinated by Mary Wareham of Human Rights Watch, has seen its membership double since the launch; it is now comprised of 48 nongovernmental organizations in 23 countries. One week after our campaign launch, the UN Special Rapporteur on extrajudicial, summary or arbitrary executions, Professor Christof Heyns issued his report on lethal autonomous robots that cited a wide range of objections to the weapons and called for all nations to adopt national moratoria and begin international discussions about how to address them. On May 30, when Professor Heyns presented his report to the Human Rights Council, 20 nations spoke on the topic for the first time. The speakers included all five permanent members of the UN Security Council; leading nations of the non-aligned movement (NAM) such as Brazil, Cuba, Egypt, Indonesia, Iran, Morocco, and Pakistan; and humanitarian disarmament champions Austria, Germany, Mexico, and Switzerland. None questioned Heyns’ conclusion that these future weapons require urgent attention now. Many expressed specific concerns over the potential proliferation and misuse of fully autonomous weapons. Some asked who would be accountable for the actions of a lethal autonomous robot that is not controlled by a human. Several highlighted the key ethical concern of whether it is right for humans to cede the decision to target and use force over to machines. Russia and others asked about the implications these future weapons might have for human rights doctrine and international humanitarian law. The United Kingdom was the only nation to publicly oppose the call for a ban on the weapons and state that existing provisions of international law would suffice to address the concerns raised. By the time the annual Convention on Conventional Weapons meeting got underway on 11 November, the stage was set for diplomatic action. There was a positive reception when the meeting chair, Ambassador Jean-Hugues Simon-Michel, Permanent Representative of France to the Conference on Disarmament, introduced a proposed mandate for the convention to begin work on this topic in 2014. Almost all of the 18 nations that responded expressed explicit support for the draft mandate. Even more importantly, none opposed it. Pakistan was perhaps the most supportive of the call for a ban on the weapons, pointing to the role of the Convention on Conventional Weapons in serving as a forum to prohibit weapons preemptively, including blinding lasers and weapons that result in fragments that cannot be detected by x-ray in the human body. Several nations said that lack of clarity over the kinds of autonomous weapons and systems of concern was exactly why experts need to start considering this challenge. Ambassador Simon-Michel said he had deliberately provided for a broad mandate as it marks the beginning of efforts to define the problem and the international response needed. Most nations however agreed that the new work should focus on lethal autonomous weapons systems and not remote-controlled aircraft or drones. Due to the consensus-based decision-making of the Convention on Conventional Weapons the mandate could have been blocked by a single nation objecting. Despite all the expressions and indications of support there was no certainty the mandate would be adopted. So when it was gaveled through, there was applause and a collective sigh of relief from campaigners in the room and online around the world. A lot, it turns out. The mandate could have huge implications for international law and robotics, as well as multilateral diplomacy. The consensus of governments to take on killer robots also represents a recognition by the traditional Geneva-based disarmament diplomatic community that the Convention on Conventional Weapons should not become as moribund as the Conference on Disarmament, which has failed to do any substantive work since 1997. Diplomats have difficulty making a case for what they do in Geneva when their efforts result in no progress. We of the Campaign to Stop Killer Robots are convinced that the movement in Geneva marks the beginning of a process that will ultimately conclude in a treaty banning these weapons. Whether that happens through a sixth protocol to the Convention on Conventional Weapons negotiated in Geneva or through a new international instrument negotiated outside the UN really is not the question. The fundamental question is the necessity of banning killer robots. While the issue of killer robots is now firmly on the international agenda, where it goes from here depends on whether governments are willing to develop and articulate sound national policies that prevent their militaries from ceding the right to make life and death decisions over human beings to machines. For governments to find their ‘political will’ civil society must speak out strongly against killer robots. And the Campaign to Stop Killer Robots is the only civil society coalition tackling these weapons head on. Our success depends on your help – financially and as part of our grassroots activist campaign. Please consider supporting the Campaign to Stop Killer Robots with a donation or better yet, support us both financially and with your active efforts to ban killer robots.